Kim Namhee mentioned tvn 'Goblin' a project right before tvN 'Mr Sunshine'. Viewers may know him as Mori Takashi in 'Mr. Sunshine' now, but he appeared as minor role in KES's last drama 'Goblin'. Now that he got popular in 'Mr Sunshine', people made clips of his scene in 'Goblin'. People realized he was that doctor from 'Goblin', and amazed by his acting. "Because of the Gobin, I got a call for audition. Honestly, it's risque for director. Back then, I didn't just audition for Takashi but did other roles too. I think that audition was to see whether i can do minor role like 'Goblin' or something more." Kim Namhee did the role of a doctor who died tending his patients. It was a minor role, but to give him call for audition may mean that he left quite an impression to production company? "It wasn't a big role in Goblin. I was really nervous shooting, but heard something like 'wasn't bad in real shooting'. The current company was also after Goblin. I'm thankful to that drama. " Kim Namhee appeared in subsequent PD LEB and writer KES projects, and his part is getting bigger. There are some group of supporting actors/actresses who shows up KES dramas frequently, some considers Kim Namhee as one of them too. But Kim Namhee denied it. "I don't think that way. I told writer "I want to do next project too" but writer avoided answer. So I didn't think that way. " Kim Namhee left strong impression thru 'Mr Sunshine'. It is a happy event for an actor to receive such love, but it could make picking next project harder due to image from this drama. "I don't worry about that too much. People may thinks of me as Takashi, but then I need to show I'm not Takashi in next project. I should be that character, so that people say 'That was Takashi?" instead. Haha"
"But this character was a bloody villain, so I hope for not so much of villain in next project." The future Kim Namhee dreams is simple but very honorable one for actor. "I want to be an actor who really acts well. Even just doing one project, I want to leave a strong impression by acting well in good project. Thru 'Mr. Sunshine', I want to be an actor for Japanese role for 10 or 20 years. If young juniors can refer my acting as how to act like Japanese, it'll be big achievement for me." One more interview with Kim Namhee, our beloved(?) villain. 'Mr. Sunshine' Kim Namhee "Practicing Takashi thru watching Choo Sunghoon... Want to be an actor with proven acting skill." "It must be a risky move for director. To give a chance to me, who doesn't speak Japanese nor never in a big role, it's a chance one never heard of"
Gamble was successful. We're talking about the actor Kim Namhee(32) who did the role of Japanese Colonel/nobleman 'Mori Takashi' in tvN drama 'Mr Sunshine'. His character with fluent Japanese/awkward Korean - even the blood vessle in his temple seems to be terrifying - made him popular and viewers thought him as a real Japanese. But in reality, he didn't look like someone with wicked laugh after he killed Hongpa. He was smiling free and easy when we met him in Kukminilbo building in Yeodo, Seoul. "I'm glad I portrayed a villain really evil way." 'Mr Sunshine' tells us history of Righteous Army in Hanseung in early 20th century. Kim Namhee explained that because Takashi represented the cruelty of imperial Japan, he tried to show it real. One of them is how he speaks. 'Gong Daeyoo, who was Major Sasaki in the drama was my Japanese teacher." "For Korean words, I broken down all words syllable by syllable to show Japanese accent and then memorized it. For Japanese, started from memorizing words/sentences/accents, added acting on it and repeated it indefinitely." "In the beginning, the script was all in Japanese, but later Korean lines were added, which made it more complicated. I need to find the pronunciations where Japanese will not be able to pronounce in Korean. I was able to find solution from athelete Choo Sunghoon(Korean Japanese). I watched all his talk show appearance with him and his daughter. Also, on youtube, there are lectures by Japanese native teachers, I listened their Korean instead of Japanese. (laugh)"
He spent one month in Japan with a friend who lives there, after he got confirmed for role of Takashi in July, to perform Mori Takashi better. On the drama site, he got helps from Lee Byung-Hun (Eugene Choi). "Sunbaenim showed Takashi character he analyzed, and showed his acting of this character. He gave me really helping advise , to use various expressions like laughing, serious face, and other expressions. When I felt the scene wasn't satisfying, he caught it before I said anything, came to me to ask about it, being very caring." "I'm a bit wimpy" "Because I want to act well, I get stressed and burdened easily." The early morning he had to shoot the intense reappearance scene, he had to go emergency room. "Maybe due to stress, I got stomach cramps and had to get a shot. I wasn't able to eat anything til shooting the scene. " "If you look at the scene when I was on horse to meet Lee Byung-Hun sunbaenim again, dark circle around my eyes were really bad. If that made the scene more intense, it's fortunate." Chance visit to acting school on his way to high school made him majored acting in college. He started as a theatre actor, debuted in the movie 'Ode to youth'(2013), left strong impression as a stalker of 'Mindle'(Jang Seuhee) in drama 'Big sister is alive'. In 'Gobin', he did minor role as emergency doctor who died of overwork. To our question of what he dreams as an actor, he answered "A man who's happy when he's acting". "I want to be an actor who usually look easy going, but look like a different person when he's in the role. I think people who needs to act to live, who finds happiness when he acts are like that. Some may worry about not losing the image of Takashi in other roles, I want to surprise people in next project that "That was Takashi?". There are other sweet interviews, where Kim talked about his girl friend and now his wife he just married, who supported him since he was in college. Korean fans had been complaining why he's not doing interviews, but he did so many since his return from honeymoon . He was doing small roles for long, I'm glad he got a break in this drama. And he deserves it! Also, I want to watch LBH acting Takashi. Hope there is a making for that. Tehe. Another FMV to get me through the weekdays !! Any production team releases preview statement for upcoming episodes? Eugene & Ae Shin's deleted scene from the special segment. Wasn't this the time after EC told AS that he was a slave, they were kinda 'distant' for awhile.. or was it after the incident that AS was ordered to shoot EC?? Anyway.. if the scene had been included, EC would probably saw that AS was talking to Soo Mi on the street.. or if near enough, would he have seen how DM was abusing SM that he got slapped by AS. If EC had seen all these beforehand, it won't be much of a secret shared between AS & SM to tell after that. Well, just a thought while waiting.. and still waiting.. for Saturday to come. Text preview for episode 23.. is such a non-preview, but here it is. Eugene and Dongmae found Aeshin and Hina among the blazing explosion. 'Please let her live, just for that, I'll go like wind"
2.5 more days to go! As always, thanks for the synopsis. That second line is making me nervous. Edit: I hope you keep a lookout for the synopsis of E24 too. I am really curious to see how they word it. Now that filming has ended and officially opened for sightseeing, there have been a lot of IG sharing of fans/public visiting the Sunshine Land (Sunshine Studios) to see the open set of the drama. Some pages back @cynkdf has highlighted the VisitKorea page. “I’m done thinking. Let’s. 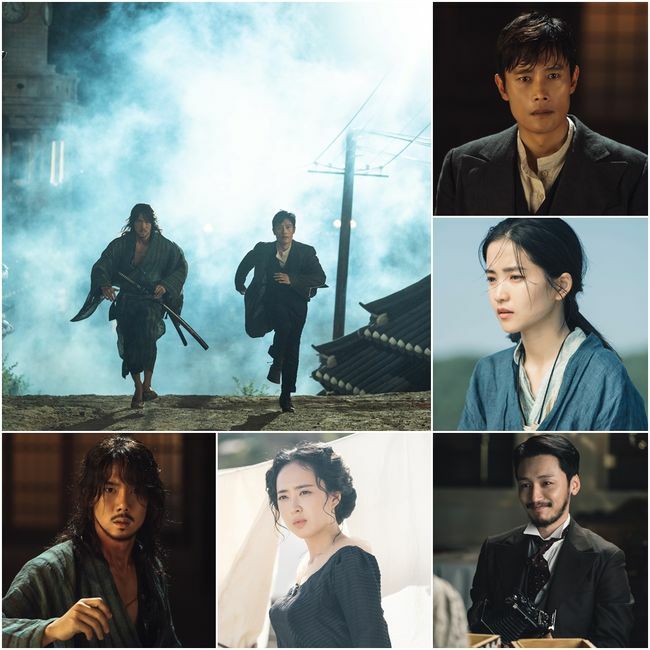 Become a couple” A weekend drama, Mr. Sunshine, starring Lee Byunghun and Kim Taeri, have been getting a lot of attention lately. With drama’s popularity, film location “Nonsan Sunshine Land” is also receiving attention. Next to the Sunshine Land, “Sunshine Studio”, where the shooting of drama Mr. Sunshine was held, will be open to public sometime after the drama ends on September 23. Take a trip down to Nonsan on a clear autumn day and relive the scenes from the drama. Lots of photos shared by Ruro who went to see the filming location/open set with MR.SUNSHINE caricatures. Fans going to MR.SUNSHINE Land, do share your thoughts & pics here. Heading into the final two episodes, in your opinion, which characters among the main five are in the greatest danger of tragically dying and which of them have the highest chance of making it out alive by the end? IMO, the person in least danger and the highest chance of making it out alive is Hui Seong. Dong Mae follows next - there have already been way too many near death experiences with him, so I think he will live. It also gives him a chance to start anew, but now, fully a Joseon man. Ae Shin is at third place. Yes, she is walking headfirst into danger, sniping enemies, planting bombs, getting injured, carrying a bounty on her head etc but even after all this, the show has emphasized through many other characters that she needs to live/has to be saved, so I believe that she will also make it out alive. Kudo Hina has an 80% chance of dying. The preview of Dong Mae carrying her on the same beach show in E21, which is in the town where her mother is buried and the shot of her lying against Dong MAe's arm makes me think that she is going to die from her injuries sustained by the Glory Hotel bombing. The person with the highest chance of dying, the one in gravest danger, is Eugene. I have a bad feeling that he is not going to escape his journey towards the flame. He will either end up being a martyr for Joseon or he will sacrifice his life to save AS. Lee Byunghun, Kim Taeri, Kim Minjeong nominated for APAN Star Awards 2018. I'll list nominees for our show Mr. Sunshine. For Grand Prize, other nominees are Kim Namjoo(JTBC Misty), Sohn Yejin(JTBC Something in the Rain), Lee Seongyun(tvN My Ajussi), Cho Seungwoo(JTBC Life). The award will be held on Oct. 13th, in Seoul. Will be broadcasted thru tvN. @mistymorning Thanks and for the translations!!! Kim Nam Hee has such a strong presence for a supporting role. I love stage actors who blossomed into movie/drama roles with a little luck and lots of perseverance! The APAN Grand Prize also has fellow stage/musical actors LSY and JSW. Good luck to everyone at the awards! Will miss this drama which has been a part of my weekend for the last few months! Thanks so much @mistymorning for the wonderful article(s) translation as well as the APAN info. We are truly lucky to have you at the thread, always keeping us in the loop. Hopefully we'll have more fans joining in for the last two episodes this weekend. Compared to other threads, MR.SUNSHINE has less pages but a whole lot more views. It may not be a shining ending.. but having the last interaction, participating come what may would be awesome. Anyway, have to agree with @mistergenie about the survivors, it's kinda going the path that EC will return to fight and die in Joseon. It may all seem for AS, to keep her alive but it also meant defending his own motherland. Although I would hope that he'd be able to keep his promise to Kyle, to come back to America. Have a feeling that while Eugene might not make it, his widow would be the one going to New York. For HiNa, Glory Hotel was her life.. she may or may not succumb to her injuries. The preview specifically highlights that aspect (just like when DM was shot, or stabbed into the ocean) over and over again, only to show him survived both times. So, it'll probably work the same magic medicine again. Those not in the preview will not make it. Such a sinister promo mode here. Along with Eugene, a lot of the RAs will perish as well.. ES, the baker, the pawnshop brothers, not sure about Gwan Soo and Do Mi, will they join the fighters as well. Oh dear what is all this .. we're already speculating deaths .. where's the Sunshine, KES! @mistymorning many thanks for the translations, especially the interesting Kim Namhee articles. He is such a great addition to the cast! ep 23 - Hina will die in Dongmae's arms. ep 24 - Eugene will die a hero in battle. Bakery brand PARIS Baguette, announced on Wednesday that it had sold about 250,000 pieces of Rainbow Castella in the past two months. This is more than five times more than the average sales of new gift products. 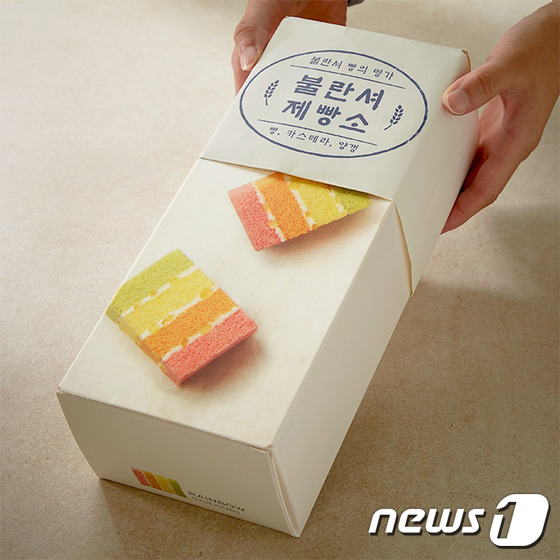 Rainbow Castella is a product featured in tvN's drama 'Mr.Sunshine.' It is Castella cake with layered colors and characterized by a soft texture that melts in the mouth. Some 100,000 units were sold during the Chuseok holidays this year. Isn't this the poster used as PPL prop in the drama? This IG account has various pics of the MR.SUNSHINE Brick Toy sets. It's a highly popular gift for the children (and fans) during the holidays. As if on cue, they've just released the weekly behind-the-scenes snippets.. will these be the last ones we'll see? From Hamandaek to Huisung! Unreleased behind the scene. staff: (Soulless reading to mark time to later add shouting from Japanese military partying) hurrah for Japanese Emperor, hurrah for the great Japanese empire! scene: EC and AS kneeling right in front of the gate of US legation in Japan. Both of them has held hands high. EC's very focused, but AS seems to be a bit out of character, watching US soldiers running. And AS surprised by the sound of gun shots. Circle to show AS's expression. scene: where Hadrio bros asking HS to pay monthly rent. Starts shooting and HS doing ad lib. HN: Ah.. did you just make it? DM: No, people named it. Staff: What are Mae-Wha couple shooting today? Awesome translation @mistymorning, can't thank you enough!